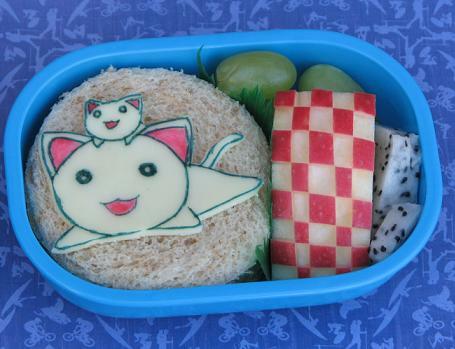 When I asked what Kidlet wanted in his bento today he said "The floppy kitties from Azumanga Daioh". I couldn't have been more thrilled with the request, easy easy!!! :) For anyone who doesn't know, Azumanga Daioh is an anime. I always refer to F&B as my floppy kitties because they are scary-flexible and you can pick them up and they sort of flop all over like they have no spines, kind of like ragdoll cats. I absolutely love this because I absolutely love Azumanga Daioh! Pure awesomeness, Jenn! Great job! Now my girls want the floppy kitties from Azumanga Daioh. LOL.